Big Fish Budapest Hostel kohteessa Budapest, Unkari: Varaa nyt! Agressive or anti-social behaviour is not tolerated, especially at night, in this case we keep the right of an early checkout without refunds. 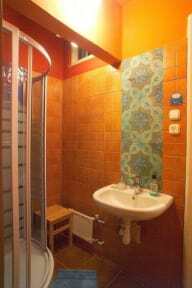 Big Fish Hostel is centrally located just five minutes' walk to the metro and Andrassy utca, near the trams and a supermarket. This hostel features very warm, homey décor, laundry service, bicycle hire and free Wi-Fi, as well as 'a lot of maps and folders available to the guests', according to Hostelworld users. We like their accommodating, friendly staff who are frequently praised for their eagerness to offer good advice on local sights. Small and cosy, Big Fish Budapest is perfectly located downtown, with an ATM, supermarket and public transport right on the doorstep! Visit the local bars, ruin pubs, cafes and restaurants - all within walking distance, making it a great base to explore the city! We offer spacious, bright, and colourful dorms with comfortable new beds, each with their own power point, reading light, and large personal locker with plenty of space for your backpack! We have huge windows with plenty of natural light, as well as large shutters for the night time. We have individual bathrooms with toilets and hot showers for all the privacy you need, and a fully equipped kitchen and common room with FREE espresso, specialty teas, with spices and oils for cooking, available any time! The common room is cosy and intimate with a wall mounted projector and computer - a great social hub to meet other travelers. FREE WiFi is also available throughout the hostel. Our 24 hour reception has no curfew or lock out, and offers FREE towels, FREE padlocks, FREE city maps and any recommendations or advice you might need about your stay. We can book you airport transfers and taxis as well as various activities including thermal bath and Sparty tickets, walking tours and bar crawls, boat cruises and even caving adventures! Our in-house laundry service includes washing, drying and folding, as well as ear plugs available for the light sleepers. Join any of our in house activities run by our local Big Fish team, from communal cooking and movie nights, to drinking games and bar crawls to some of our favourite spots! Come visit us and join the Big Fish family! Stayed three nights at Big fish Hostel and had the most wonderful time ever! Staff was very friendly and helpful and all the facilities were very neat. Atmosphere was relaxed. The location was very handy, main attractions were close. Overall i have nothing to complain, definetely going to revisit someday!